Willowdean (Danielle Macdonald) is the teenage daughter of a Texas beauty queen (Jennifer Aniston). As a form of protest, Will enters a local pageant and, as others follow her example, discovers the meaning of true beauty and friendship along the way. On paper, Dumplin’ may appear rather predictable. A fish out of water / coming of age story that we have all seen many times before. However, underestimate the poignancy and emotional power of Anne Fletcher’s film at your peril. Based on the best-selling novel by Julie Murphy, Dumplin’ is a wonderful, feel good film. Yes the narrative holds few surprises, but it has so much heart that you cannot help but fall in love with this movie (and its foot-taping Dolly Parton soundtrack). This is the film to watch if you are ever feeling low. Indeed, that is exactly what drew Fletcher to the project. The cast of Dumplin' all give endearing and heartfelt performances. Jennifer Aniston, for example, is really rather fabulous as Rosie. In lesser hands, she could have been portrayed as a wicked cartoon villain. There are no mean girls in this movie, however. While she has unwittingly contributed to Willowdean’s lack of self esteem, Rosie clearly loves her daughter. Willowdean, of course, is the centre of Dumplin’. That the story works so well is largely thanks to Danielle Macdonald's funny, sensitive and engaging performance. So impressive in Patti Cake$, Macdonald creates a character that is endlessly likeable. We love her exactly the way she is - a feeling the film encourages. I was surprised by how much I enjoyed Dumplin’. I was fully invested in Willowdean’s journey - all the way to the film’s surprisingly moving conclusion. The Dumplin’ soundtrack features several reworked versions of Dolly Parton classics alongside new material written by Parton and, producer, Linda Perry. 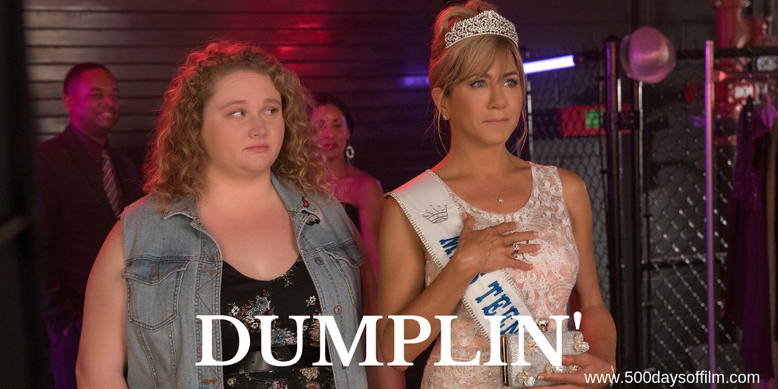 Have you watched Dumplin’? If you have, what did you think of this film? Let me know in the comments section below. Alternatively, come find me on Twitter @500DaysOfFilm.